Brother Eagle circles above within the Four Directions of the People. 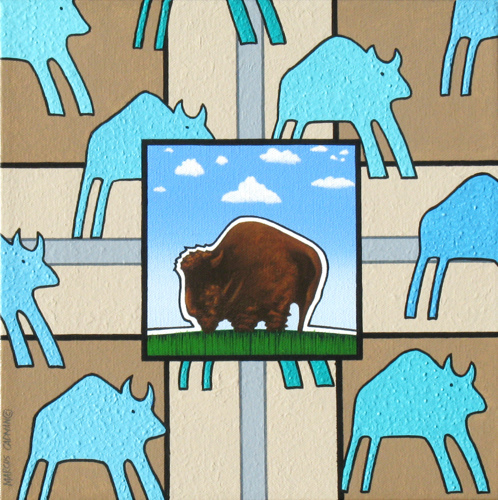 A thundering herd of buffalo race across symbols of The Four Directions in this modern take on a buffalo hide painting. Acrylic on gallerywrap canvas. The design and colors of the painting wrap around the sides of the piece. Canvas is 2 3/8 inches deep. 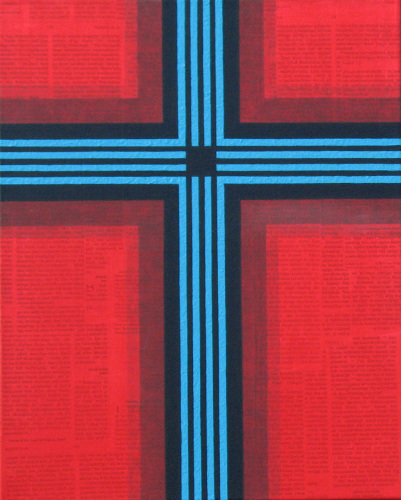 Religious symbology is layered with Navajo bibles in this striking piece. Raised textured lines cross and meet from the Four Directions. Navajo bibles pages and acrylic on canvas. A modern flag piece with the colors of the Four Directions of the Navajo. 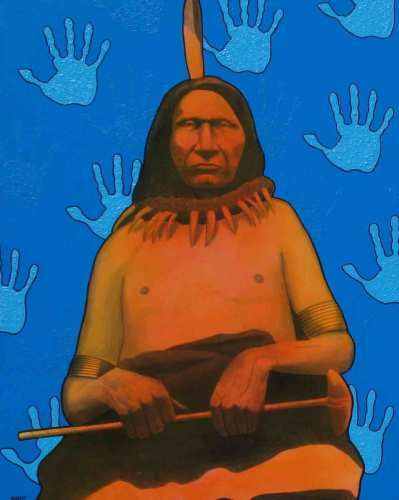 The yellow and white are textured to symbolize Mother Earth. Tribal and modern life come together. 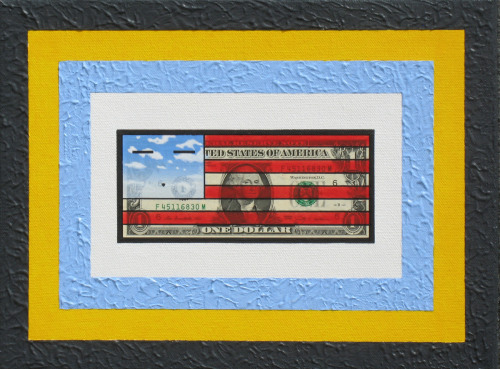 Acrylic and currency on canvas. Bingo sheets were played by family members in a losing effort but brought back to life with this whimsical contemporary piece that embodies the humor and not so humorous side of Indian Gaming. 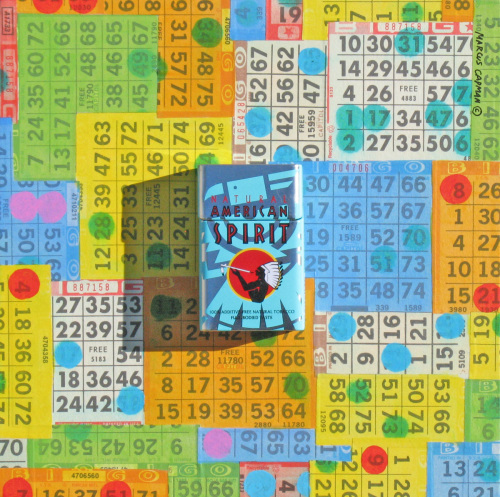 Bingo sheets and cigarette tin on panel. The colors of the Four Directions within the Navajo way encompass this American flag that is created with spiritual and historical imagery. 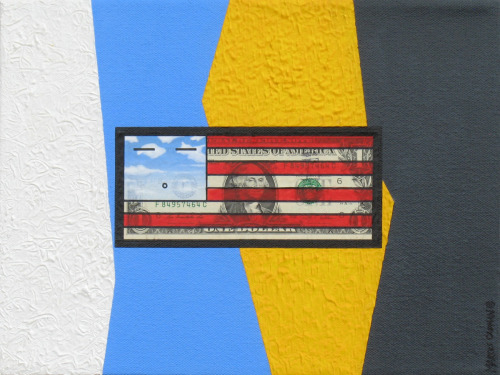 Acrylic and currency on canvas. 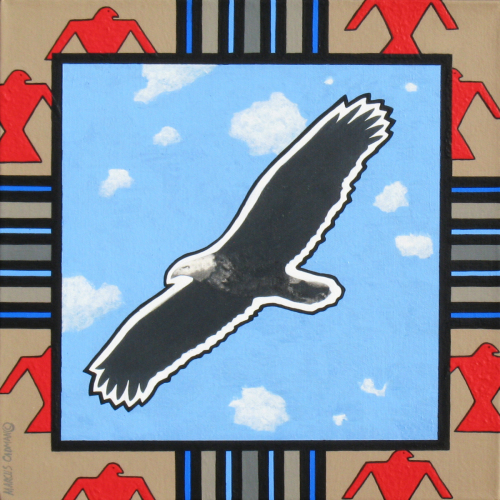 A flag piece showing American colors and colors of the Four Directions within Navajo Philosophy. Texture is added to each color to represent the Earth. The face within the clouds is that of a Holy being. 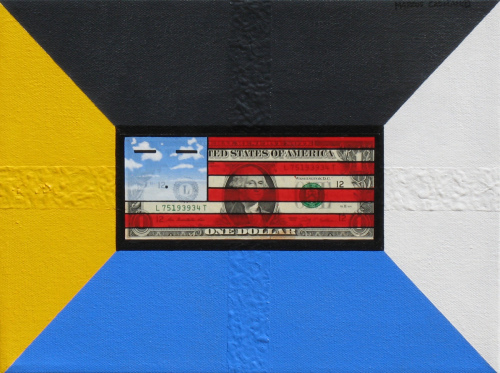 Currency and acrylic on canvas. 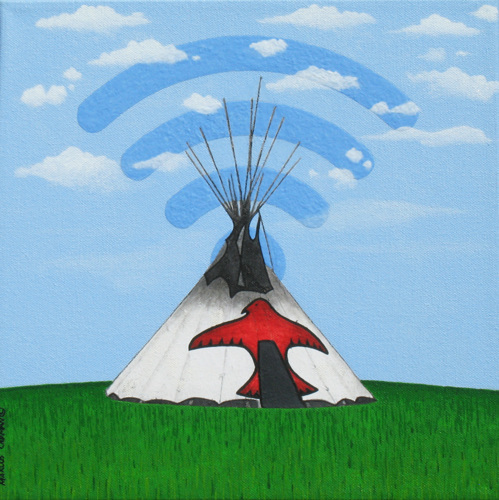 This piece speaks of the interchange of the Tribal world and the Modern world. A simple idea of the New Generation spending time with one's Elders. Photocopy transfer and acrylic on canvas.